Lighthouse Plumbing Services is a family owned and operated business that provides a full range of residential and commercial plumbing services. Our personal service and highly skilled team has served customers in the Palm Beach/Jupiter/Tequesta area for over 15 years. We feel privileged to serve all of our customers and we look forward to serving you. Contact us today for a quote or to schedule service. 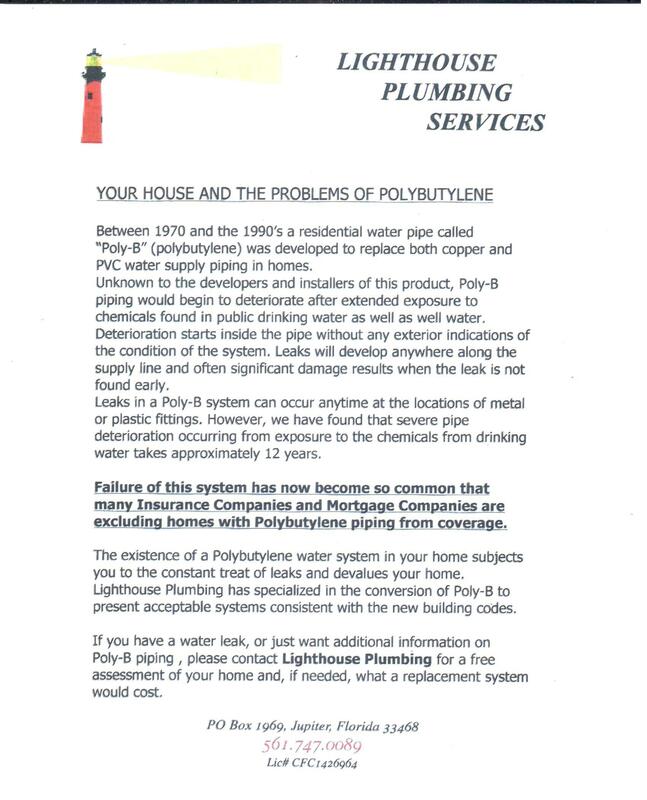 PROBLEMS WITH POLYBUTYLENE. CLICK HERE FOR MORE DETAILS. Jupiter, Tequesta, Lake Park, Hobe Sound, North Palm Beach, Singer Island, Palm Beach Shores, Stuart, Riviera Beach, Palm Beach Gardens, Palm City, Juno Beach, Boca Raton and surrounding areas.